You can also turn those old cereal boxes into cute magazine holders with some old wrapping paper. I try to use my cloth grocery bags at the store. However, sometimes I just forget. We re-use the plastic bags we end up getting as mini garbage bags for our bathroom waste baskets and we also use them when we clean the cat litter boxes. Fun post. :) Any tips for removing labels from bottles? My partner & I are getting into making our own bar condiments (bitters, cured fruits, etc. )and I’d like to be able to put correct labels on the bottles we re-use. We’ve had the most luck soaking bottles in soapy water for about 30 minutes and then just scrubbing the labels with a sponge until they come clean. As long as you let ’em soak for a bit they’re a lot easier to remove than they are when they’re dry. Hope it helps! Real mayo (not lite). Let soak for 24 hours and it will peel right off. Basically anything with oil in it will remove the gunk that is left behind by labels. Rub mineral oil, baby oil, olive oil, 10w40 etc onto the surface of the label and let it sit for a few hours. It should rub off within a few hours. If it’s a really thick label or it has a lot of glue on it, it might take a couple applications of oil to remove completely. Try vegetable oil, it works very well, don’t use too much. Just put some an old piece of paper towel (We use paper towel but it gets many non-food reuses). We live in a small town and are lucky to have a great little post office with some extra empty shelves. It is now the local book swap. You take the novel you just read, drop it off and get a new one. Also good for magazines! A hospital near me has a similar thing going on near one of their waiting rooms, as does the local hospice and the retirement community my grandmother lives in. There are lots of places to drop off your used books and magazines. Magazines in particular can be dropped off in a waiting room once you are done with them. This http://www.marthastewart.com/article/cereal-box-organizer?xsc=stf_MSLO-ARTICLE is what I do with cereal boxes. We use old IBC root beer bottles with pour spouts picked up at Sur la Table for our salad dressing (olive oil and vinegar). 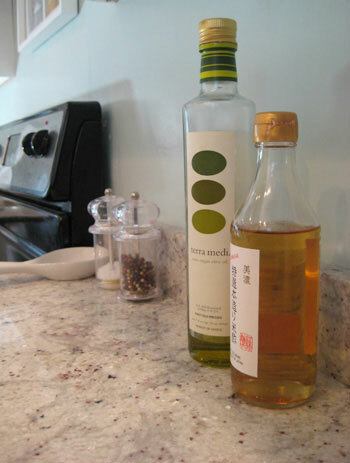 We use a clear bottle for the olive oil and a brown bottle for the vinegar. We also use a clear IBC root beer bottle for our dish soap. Each time we buy new soap, we buy a different color that matches our kitchen. Don’t forget that you can also bring your shopping totes from the grocery store to any other place you’d shop – like the mall! No need to use plastic or paper bags there, either. Thanks for the other great tips! I wish I had a pic to share, but at our old house I cleaned all the little quart containers of paint we had hanging around, spray painted them, soldered them together into a big square, mounted it on the wall, and used them for sorting papers, pens, and small computer things (small external harddrive, etc.). It was functional art if ever there was! great post with great ideas! and i love the apple juice jars as vases. i save mine anytime i go to einstein bagels for that very purpose. Those darling apple juice jars are filled with Martinelli’s apple juice — you can buy a flat of them at CostCo. The bummer is that they are now plastic bottles — not the super-cute glass! Also wanted to add that instead of buying all of your spices in those plastic bottles, buy them in bulk from a local grocer, buy little glass bottles (IKEA has them, in addition to a million other places), make your own labels, and voila!–no more useless plastic bottles filling up landfills. And you get to be creative with your own labels. Right up my alley anyway! Great minds think alike! 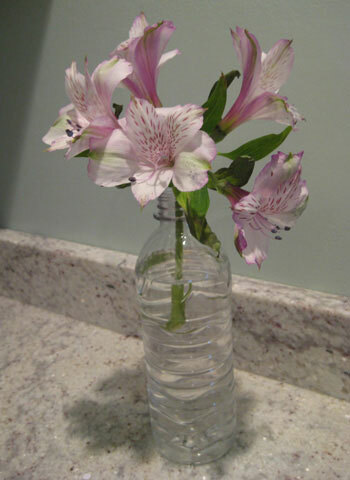 I love all the household tips used from everyday items. We also keep all our bottles as well; great for displays and memories. I think the egg crate is the most useful object! I could go on for days about reusing stuff for arts and crafts and various games at the summer camp where I work. Toilet paper tubes, egg cartons, tennis ball tubes, strawberry baskets, packing peanuts, plastic bottles, you name it. Not that you need this, Sherry! But, I was listening to Beauty Talk w/Eva Scrivo and she said that only 1 teaspoon of used coffee grounds, mixed with your favorite moisturizer, works better as a cellulite treatment than any product on the market. Cool, huh? we reuse old cans for art supplies too, but i cover mine with pretty wrapping paper. i want to start doing that with cereal boxes like others have posted to hold my old dominos. rip domino. you can also reuse diaper boxes (for any of you with babies) they are good size for storing things and they have cutout handles on the side. i cover them with paper too and use them to store things in my babys closet. So many fabulous tips! Keep ’em coming. We’re taking notes! My mom always used a big coffee tin for all of our crayons when we were little. We had so many, and we could dump them out on the table and use them, but then just throw them back in and store them on a shelf. Also, if the labels are sticker like, not glued all you need to do is boil some water and funnel it in. The heat gets the label to slide right off, usually without even a smidge of residue. My husband and I drink a lot of wine, and we keep a wine journal so we use this tip a lot! I stopped buying wax paper years ago. My Mom’s tip: the liner in cereal boxes is easily opened up and wiped off. It is thicker and stronger than any wax paper. I use it to put in between portions of meat that I am going to freeze so that they aren’t in a big blob stuck together. I’ve noticed that some cereals have switched to a cheapy version of the bag, but most still have the good ones. My grandmother used cereal box “wax”paper” when I was growing up. She’d wrap her seasoned chicken for the nights meal….that was back in the early ’50’s….back then nothing went to waste…. Baby food jars are the perfect size for storing nails, screws, anchors etc. love all of these ideas!! I use the cereal boxes to make sketchbooks for my kids…cut off the top and bottom, punch holes with a 3-hole punch, add scrap paper (I like to use all the misfed printer paper) also 3-hole punched, tie it up with ribbon or string, and viola! I repurposed my childhood twin-size comforter here into a full-size spread for our guest bed. Pretty easy, I did it in one afternoon, and cheap too. All it cost me was two king-size flat sheets (DH picked up some super-lush 520-count ones for $12 on sale) and a package of batting, 45″x60″, cut into rectangles 45″x15″ (two for each side). We also re-use plastic produce bags (because we take our fabric totes to the store) when cleaning out the kitty box. Another project I did when I was a kid was to cover a tin can with random pieces of masking tape, then rub all over with shoe polish and spray with craft lacquer. Makes an interesting pencil can. My mother recently found a website that suggested using old children’s tee shirts as cloth diapers! Speaking of toliet paper roles that someone mentioned above, I seen in a mommy mag I read (I can’t remember which one, either Parents or Parenting) that a good use is for storing extra cords. I used to forget my reusable grocery bags all the time but now I bought a reminder kit from Bagnesia- it even comes with it’s own reusable bag that folds up really small and has great products in it so I never forget my bags anymore. First – ran across your blog recently and have been loving it as I brainstorm things for our new condo. We’re already planning to use your fun wardrobe idea in our bedroom. 1. 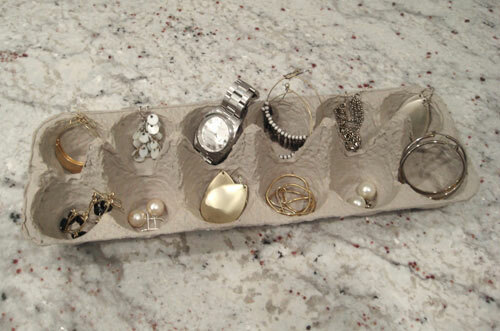 Like your porcelain egg crate, a fun way to store jewelry could be a fun ice-cube tray! They’re usually fairly inexpensive and come in fun colors. 2. If you’re in a pinch, expired sunscreen can be used as shaving lotion. 3. You can recycle old cloth napkins (if they become too stained) by cutting them into 5-5.5 inch squares and gluing them to pieces of felt to create fun drink coasters. 4. And another thing I’ve become a fan of is running the kitchen sponges through the dishwashwer to make them last a little longer before needing to be replaced. I shred old magazine pages & use it in place of tissue paper for pretty, colorful wrapping in a bag or box. If you use the perfume ads you get a nice, subtle fragrance to your gift! little glass jars of garlic – peel off label and wash them. Then can turn into a jewelery (rings?) holder – I’m going to put my nephew’s photo in the bottom of one and glue some cut fabric around the jar and give it to his mom for xmas. Also – Have an extra towel holder in your bathroom that goes unused? I use mine as a necklace/bracelet holder. Just clasp your necklace around the bar, or fold in half over the bar. My family loves to can. We moved down south and started to do it less often because we didnt have access to produce that was worth saving. Instead of throwing away all those mason jars we use them as drinking glasses! Very country chic! Also, an earlier comment from Kathy made me think of something. I def love 7th generation products and I am excited for all the eco friendly cleaning products they are coming up with BUT instead of breaking the bank with those exensive cleaners I use bleach and vinegar for all my cleaning. Works great! 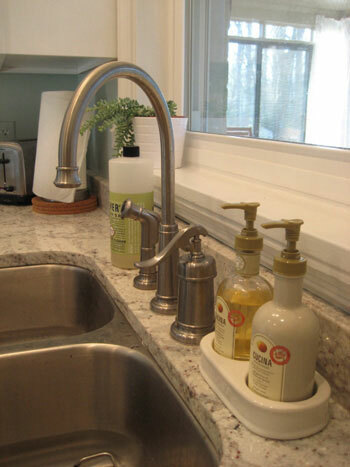 Love that Anthropologie soap and lotion set — I have the same one! AND, it’s now on sale on their Web site for $24.95 plus free shipping if you have the Anthro card… so you can bet I am buying a few more to have on hand as gifts!! 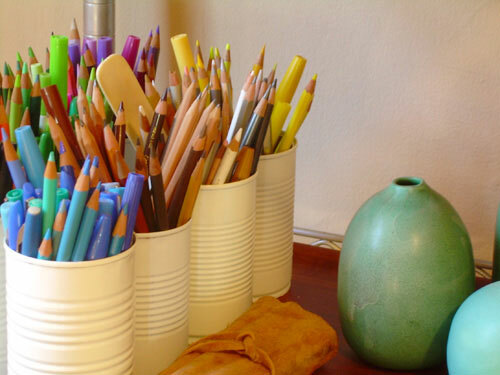 I also use old tin cans for my kid’s markers and pencils and loved the idea of painting them! Can you please tell me what kind of paint is good? Thanks! Metal is great at taking paint, and spray painting the tins is probably the best way to get a nice even coat of paint. Just turn the cans upside down on a big piece of cardboard outside (good ventilation is key) and spray them lightly from about 12″ away to keep from getting drips. A few thin coats is always better than one thick one. Then just be sure they’re completely dry before bringing them inside to keep out those nasty fumes. Happy painting! So I think the repurposing section is the right place for my question? I am in desperate need of an end table and I have a cheapo unfinished Ikea TV tray that I was thinking about transforming– I was thinking about painting it and attaching a woven tray of some kind on top. Only problem is I’ve never done anything like this before and have no idea where to begin? Your painting “how to” is helpful but what do I do about attaching the tray??? Any ideas/inspiration would be so appreciated! Thanks so so much!!! I can’t believe I’m even thinking about doing this- you guys are such an inspiration!! Love the idea! I would use regular old extra-strength velcro to affix the woven tray to the TV tray base. You could also try something like liquid nails for a less-removable solution. Hope it helps! I slip one over the paint roller tray before pouring the paint in. At the day’s end, or when I have run out of paint, I just draw it off and throw it away. No clean-up! Other days, when there is going to be a several hour hiatus in said painting, I will put the paint roller or brush in another plastic bag to keep it wet. I HAVE heard of people putting such a wrapped roll in the FREEZER for longer delays. I don’t have that kind of room in my freezer. If I did, it would have ice cream in it. Before my Service Dog died, I always had a stash of bags in pockets and purses, and a Bag o’ Bags in the car. Even after Gruffydd went to the Rainbow Bridge, I still kept the B o’ B in the trunk for rounding up trash in the car, for keeping garage sale finds together, for packing material when I needed to nestle something that would otherwise tip over. Conditioner can also be a great shaving cream, and is a great alternative to aerosol cans which are bad on the environment. I’d stay away from spray paint too… those nasty fumes are horrible for the environment. Shoes are something I use to go through a lot of until I discovered how cheap it is to get someone to repair them. Also, check out this site for how to create “tipsy pots” if you’re into gardening. They can be used for flowers or growing your own fresh herbs and can be made out of pots, kettles, old bowls, etc -as long as it’s deep enough for the roots -which depends on what you’re growing but generally 8 inches is safe (or something really wide). One more thing, old ceramics/dishware/colored glass can be smashed up and glued back together in colorful patterns to create art work in the form of coasters, decorations or to spice up other dishware… I’m sure there’s websites out there with specifics on this. I had a tall kidney bean shaped laundry basket that I no longer used for laundry. It became great portable storage for rolls of gift wrap and other gift wrapping supplies once I removed the lid. The 12 can fridge pack soda boxes are great for storing & organizing canned food most food cans will fit in them. You can just use white labels to label them or go all out and cover them with contact paper, left over wallpaper or even gift wrap. I am hoping you can help me find a place to send my daughter’s no longer needed glass baby bottles to be repurposed into drinkware. I have done several online searches and cannot come up with anything. Alas, we haven’t heard of anyone that does that. Does anyone know of a place that does? I agree– I’ve been using my milk jugs for plant watering cans for years now. I do have to say, however, that I think the egg carton is a little cheesy for putting jewelry in. I like to donate mine to the girl scouts along with old candles and dryer lint. They use them to make fire starters for camping. SO COOL! For removing labels, put a little olive oil on the label and let it sit for a an hour and it will slide off, also if it gets stubborn try a little WD-40. For starting a fire in our outdoor fire place my wife saves toilet paper cardboard and stuff them with laundry lint. Place them in the fireplace and a handfull of tinder and lite it. It only takes one match. A great use for empty 12-pack pop “refrigerator packs” is to use then in your pantry to store canned fruits and veggies. They dispense the cans nicely. 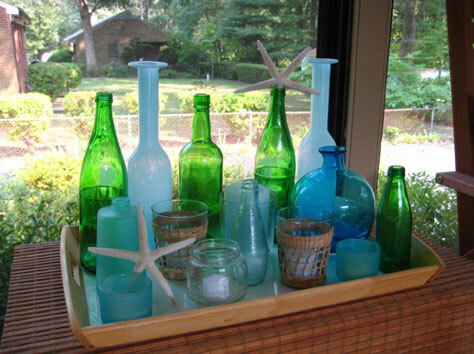 My favorite things to recycle are glass jars. They’re so useful! You can use them as a small vase for flowers (as you’ve got pictured above), candle holders, serving beverages (iced tea anyone?). I’ve actually recently posted an article on my website about different uses for glass jars. I love the idea of repurposing old cans though, with paint! In fact, I just emptied a can of tomatoes this morning and I think I might fetch them out of the bin! I love to repurpose….especially when it means we get to save money too! Double score!! I take all of my husband and son’s stained/ripped clothing and cut them into rags. I keep a pile of clean rags under my sink and the dirty ones in a bin in the laundry room. I wash all the dirty ones when I start to run low. We used to buy a case of paper towels from Sams Club each month. At $25 a pop we save $300 a year! Cha-ching!! Along the same line, while it’s not repurposing, we have saved a lot of money over the years by not buying paper napkins. I buy funky linen napkins when I see them in the clearance bins (Target, Bed Bath & Beyond, Home Goods, Marshalls, etc…) You can easily find them for under $1.99 a pack. My collection has probably cost less than $25. I would have definitely spent way more than that on paper napkins the past few years. I haven’t been able to figure any ways to repurpose and save money when it comes to tissues and tiolet paper. I can’t imagine re-using something like that. Yuck, it just doesn’t sit well with me. Reusing & repurposing is one of my favourite things to do! It gives me so much pleasure to not have to go to into a store to buy something, and simply being more mindful at home. I have a whole reuse & repurpose section on my blog, but this was one of my favourite projects. I had a big cozy scarf that was really to warm to wear, but I loved it’s pattern and soft bamboo weave. I turned it into a pillow! Also, you can repurpose filler from old, flattened pillows very easily. They pillow can be opened up & the fibre refluffed. I learned from my grandparents who lived through the depression to recycle, reuse and repurpose. Your site had some new ideas for me, especially a way to reuse the bag inside cereal boxes. I hadn’t ever thought about reusing those! Here’s my tip: I save sugar and flour bags to slip my home canned jelly jars in to package to give away. Since I don’t use plastic baggies, I also use these bags to put flour in to coat chicken, although 3 chicken breasts are about the limit. I love all these ideas; I do have a question I have two old window panes that I would love to do something with just cannot seem to think of what! Any suggestions?! We’ve seen them hung on the wall with photos behind each glass section like frames. Or you could place them on top of a table with patterned paper or photos displayed under the glass. Good luck!